Here in the beautiful Kootenay Mountains, the feeling of Harvest is everywhere. 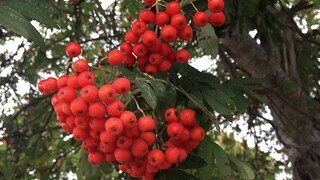 The fruit trees are full, squash are everywehere and he Mountain Ash are over laden with berries (hinting at a long winter ahead). And … the runny noses and coughs have begun. You’ve probably noticed that colds and flus have been circulating more. Maybe you’ve even had one “come for a visit” already. Today, I have a reflection that I want to share that relates to getting sick, when you’re the “caregiver”. There’s actually a way to heal faster, deepen your connections with the folks you care for AND heal some older, emotional wounds. or just someone who folks come to for help and support. I’ll share that I am indeed a “caregiveer”, in fact my work in the world is being a caregiver of caregivers. I share that because I want you to understand that I’m speaking from my personal experience here. I can struggle with this too. When we get sick, if we’re lucky, it really knocks us on our asses and we have to slow down and rest. I realize that getting knocked down by an illness can be a huge stress. (I’ve been taking immune support herbs for a couple of weeks in an effort to avoid getting sick.) We really don’t want to get sick. Ever, really. So I say “if we’re lucky” because most of us will just try to push through, right? A totally understandable approach and simultaneously, one that doesn’t really serve us in the long run. The fact that we have these pressures to “push through” is a clear sign that this society is broken and failing to serve our needs. But that’s a different article. The point I want to share today is … there’s a real benefit in slowing down AND in receiving support. When we slow down and stop pushing against the sickness, we actually have more energy to heal. It’s about recognizing and accepting where we’re at and ACCEPTING it. For some of us, it feels more like resignation, but either way we slow down. And here’s where your seasonal virus can actually be a gateway to healing some older, deeper wounds. As caregivers of other people, many of have some old, emotional wounding. We’ve learned somewhere along the way that our needs were served better by giving more than receiving support. After you decide to slow down, rest and let yourself be sick, you can now offer a gift to yourself and to others… let them take care of you. You can give an enormous gift to your loved ones … by asking for and accepting their support. You know how good it feels to give, right? To pour your love into nursing your beloved back to health. I want to encourage you to give that gift to someone if/when you get sick. It might make you cry. That happens, it’s okay. It might hurt a little to receive. That’s likely a healing kinda hurt. Harvest is related to the Earth Element. It’s about abundance and reaping the gifts of the summer months (Fire). It’s also related to the Stomach and Spleen meridians in acupuncture. The role of the Earth Element is to receive the abundance from the world and to distribute that throughout your body, mind and spirit. Earth energy is slow and receptive. So you can help yourself sync with the season just and speed your healing by connecting with the Earth element within you. Maybe it’ll actually be okay to let yourself be slow and receive the next time you get sick. There’s one significant challenge, of course, that makes it difficult to do this receiving support thing… we need more people who are able to actually offer us support. I don’t know if it’s a new trend, but I’ve been hearing this a lot from family, friends and clients for the last couple of years. So, I’ve been working on answering this question. And I’ve created some teachings and some support that I’m confident will help folks. It’s a group of like-minded, kind-hearted people using herbs, empathy &/or nature connection to root their self care. With me as the guide, we’ll weave together herbal medicines, unconditional listening, emotional processing s kills, teaching from Nature and more to keep your tanks filled. You could also think of it as a study group for the core material that I use in my healing work. Those core teachings are what the 7 week, Self Care for Rebels webclass is all about. In fact, the first two months of the Healing Wise Group will be exactly that, a deeper integration space for applying and practicing the core teachings from the class. To read more or to apply to join the Healing Wise Group, click here. This class covers the foundations of how I weave herbs, empathy and nature connection for deep healing and for daily self care. The whole 7 week course is Pay What You Feel because I want it to be truly accessible to everyone.